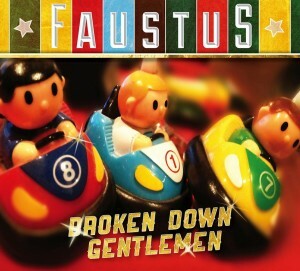 Faustus evolved in 2006 from the band Dr Faustus and released their debut album in 2008 and following this were nominated as the Best Group in the 2009 BBC Radio 2 Folk Awards. The three members of Faustus have a strong folk background, having been in well known bands before - the members are Saul Rose (Waterson:Carthy, Whapweasel), Benji Kirkpatrick (Seth Lakeman Band, Bellowhead) and Paul Sartin (Bellowhead, Belshazzar’s Feast). After a two year break, the band returned to touring in Autumn 2012 and worked on finishing their new album, Broken down gentlemen which has just been released, and the band will be on tour in April. I'm certainly not an expert in folk music but one thing I do know is that Folk music is such a diverse range of sounds (a day at the Cambridge folk festival will quickly make that clear to anyone who hadn't already realised that), but there are definite styles within that spectrum. Faustus are what I'd describe as traditional English folk music - the sort of thing that anyone who isnt a folk lover would pick out as "folk". As to what makes it traditional English folk music that's harder for me to describe, but it's a combination of the songs, the vocals and the choice of instruments. This some great folk music - the vocals in particular give the album it's strong English folk feel and sound great. The music is mainly guitar based with some great use of the fiddle and then other instruments are used to add extra richness to the music. As is common in folk music the album contains some songs that have been recorded many times - 'Captains Apprentice' for instance is a track that The Imagined Village also included on their last album, 'Bending the dark', but that song in particular sounds very different on the two albums - it's interesting to see how two groups can take a song and come out with such different but equally enjoyable results. A great album for fans of English folk music. 'Broken down gentlemen' is out now.